The Norwood Business Association was founded in 1894 to encourage industrial and business development in the town of Norwood. 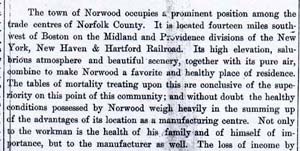 The NBA published articles promoting Norwood in local and regional publications, and they were successful in recruiting several businesses to town. In this article, an unnamed writer describes the advantages Norwood has for business development, including fresh air, low mortality and open space. The author argues that these factors are important for recruiting both labor and management.